Whatever we do to care for our upholstery, it is inevitable that it will get dirty and generally worn-looking. Dirt will get ingrained into the fibres of the fabric and it may start to look unsightly. It really is not necessary to continue to put up with this generally deteriorated appearance. Upholstery cleaning is competitively priced and offers exceptional value for money. 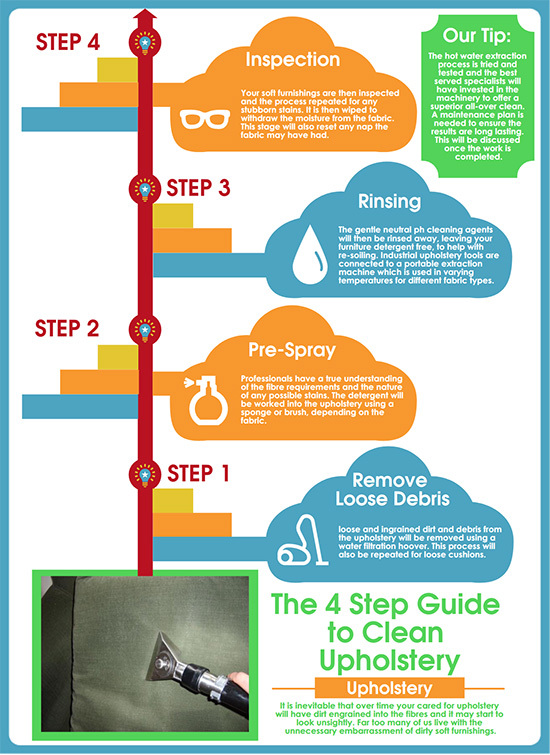 The following infographic has been put together to outline the four-step process for how to clean upholstery. Don’t live with dirty upholstery any longer than you have to. Not only is the process cost-effective but it is quick and efficient. Once you have experienced professional upholstery cleaning, you will be left feeling confident that you are a customer for life. You will also wonder why you put it off for so long, expecting for a magic wand to improve the appearance of your upholstered suite. Many of us know vaguely how to clean upholstery, however, a professional upholstery cleaner will have the knowledge gained throughout years of experience and the correct machinery and products to complete the job. We offer a superior clean and can offer peripheral services such as carpet cleaning for your home or business. This infographic goes through our tried-and-tested four-step process to achieve the cleanest upholstery possible. Our experience and knowledge of this process allows us to produce results that cannot be rivalled by our competition. We offer brilliantly clean upholstery for our clients whilst achieving value for money. Did you know?.. the hot water extraction process is tried and tested and implemented by the best served specialists. Investment in this machinery unequivocally offers a superior all-over clean. A maintenance plan is offered to ensure the results are long lasting. Call today to get pricing details or to arrange a visit on 0800 695 1118.